En-suite B.B room is one large bed in the room 1.5x 2 meter bed,room with climate control and private bathroom with big bathtub,in the room you can view the gorge and jadedragon snow mountain,,join the suny in the bed,best news T.V in china,wash stuff and all the towels paper is provide in. 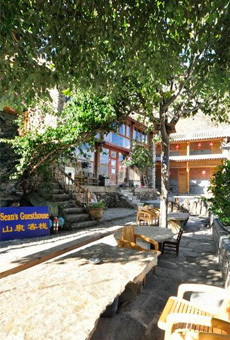 For the gaurantee of credit card and cvv number is safe with your make booking in this website, because the back stage management is only me(Sean) could enter, so all the booking's I have to check and make confirm booking, so you can trust us to living here in the gorge Sean's Spring Guesthouse. be carefully to file all the list follow show up and don't fogetting to the last step submit !